← Where’s the fairness in Remembrance funding? Brownhills Choral Society – legendary and very successful, with the noted singer George Fullelove third from left. Image generously supplied by Margaret Yeomans. There’s something that’s quite historically important been going on for months now right in the heart of Brownhills, that whilst not earth shattering, is very significant to our local history, and helps to preserve the memory of one of the finest sons of Brownhills: Chorister and Choir Master George Fullelove. David Evans has been in touch, to tell me about a ceremony that’s taking place next week at the shelter, to commemorate the renovation. On Saturday 21st April 2018 at 11am there will be a re-dedication ceremony of the refurbished George Fullelove Memorial Shelter, which stands near to the Parkview Medical Centre and the Community Centre in Brownhills. I understand that a small group of singers from the Wednesday Choir will perform some of the pieces which were popular in the days of Mr George Fullelove’s choirs. Local civic dignitaries have been invited to attend the re dedication of the shelter and the unveiling of the new information panel which gives the life story of Mr Fullelove. Following the event refreshments will be provided in the nearby Community Centre, I understand. In order that people may find out more about this great man, I commend they read this post here, about George Fullelove’s earlier career, then the one included below, which covers his final years and the creation of his shelter and legacy. He really was a most remarkable and talented, as well as very humble and human gentleman. Thanks to David for letting us know, and if you attend, please do take some pictures and drop me a line: BrownhillsBob at Googlemail dot com. Thanks. If you’ve got a song to sing, sing out! The Young David Evans – working with a number of sources, including the Fullelove family and members of the Choral Society – continues his meticulous and fascinating documentation of the history of the noted, famous and popular Brownhills Co-operative Choral Society. This is a great love of David’s, and one that is of huge interest to blog readers, including Ian Pell, who’s also discussed this wonderful history. Thanks to David for yet another great article, and if you have anything to add, either comment here or BrownhillsBob at Googlemail dot com. Cheers. 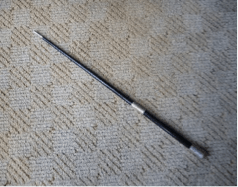 George Fullelove’s all-important Conductor’s baton. Image supplied by David Evans. 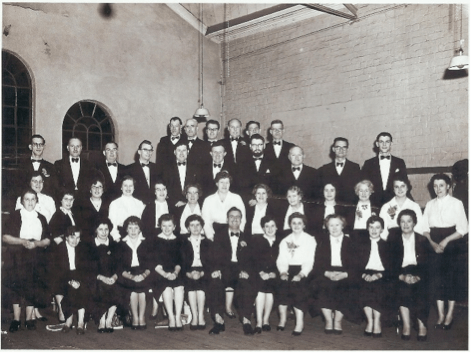 The Brownhills Choral Society was inaugurated on Wednesday 19th January 1949 at a meeting held in the Co-operative Hall, Brownhills. The first conductor was Mr George Fullelove. The accompanist was Ernie Jones, who was also the chairman, the secretary was Frank Seedhouse, and the treasurer, who served for very many years, was Jim Ewens. The weekly subscription was 3d. The choir entered the Oakengates Music Festival on June 25, 1949. This was to be the first of very many festivals and contests that the choir would enter, and gain amazing success. In 1950 they entered the Bromsgrove Festival, gave two concerts and performed Handel’s Messiah at two churches. Membership of the choir at this time was 28. It would grow to over 70 by 1971. Seven concerts were given in 1950; four were given in 1951. There was to be a pattern to the concerts, which becomes apparent in later years’ records. The minutes record that Mr George Fullelove, the conductor, died on Wednesday 13th July 1956 and that in 1957 ‘the conductor’s baton passed to their new conductor, Mr Deryck Langford. In 1959 the minutes show that in March the choir performed Mendelssohn’s oratorio ‘Elijah’ in Brownhills Wesley Methodist Church, and that the soloists were Rhylis Cooper, Alice Holyman, Jean Langford, Jack Pearce and Doug Birch. Brownhills Wesley Church, March 1959.Photo kindly provided by Mr Michael Smith, – he’s the gentleman with the fine beard. ‘Affectionately remembered by Brownhills residents for his unceasing endeavours in the cause of music and charity’. In 1960 the choir entered the Newport Music Festival where the soloists gained success, and in another concert the choir ventured into musicals, performing Gilbert and Sullivan’s ‘Trial by Jury’. The choir performed the oratorios ‘Barabbas’, ‘Olivet to Calvary’, and in December held their third annual dinner. They entered the Newport Music Festival again in 1961. A press cutting of that event is headed ‘Brownhills Choir Sweeps the Board’. The choir entered the Bourneville Musical Festival in July, went on a Cultural Weekend at the Co-operative College, Loughborough, performed for the 75th anniversary of Walsall Co-operative Society, sang in the 53rd annual Co-op Choral Festival in Derby, performed ‘Elijah’ in Newcastle under Lyme, and several other concerts that year. They enjoyed a well-earned and 4th annual dinner in December, at the Kenmare restaurant in Walsall. The choir membership had grown to 59. This image is thought to be the Society at Newport Music Festival in 1961. Photo kindly provided by Michael Smith. In 1962 the choir gave 13 detailed concerts, entered the Bournville Music Festival and the Newport Music Festival. They again performed the oratorios ‘Elijah’ and ‘Crucifixion’ that year. In 1963 they performed Brahm’s ‘Requiem’ and performed their first ‘Getaway’ Concert, in Aberystwyth, where they spent the day. This would not be the choir’s last visit to the Principality. The minutes show that at the Annual General Meeting, in February 1964, a discussion was held where the members agreed to ‘strive to improve and aim for higher standards’ This marked a turning point in the fortunes and was to bring great success for the choir. In 1964 the choir were recorded by the BBC, and later that summer Arthur Langford, BBC radio presenter and brother of Deryck, took a choir rehearsal and shared with them his own personal experiences during his years working in the BBC Forces Network. No notes exist of the details of his talk. The recording was aired in the BBC broadcast ‘Brownhills Co-operative Choral Society and other choirs’ on Wednesday December 23rd. Five other major concerts were performed in 1964. The choir were later to make two records, feature again on BBC Radio, and appear on BBC Television. 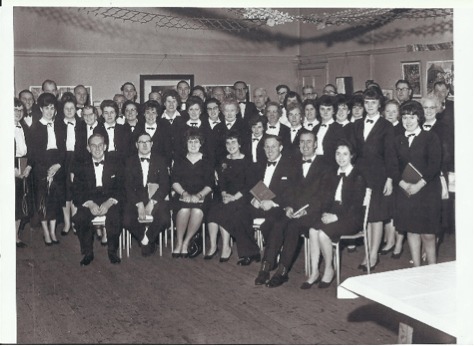 In May 1965 the choir took part in the ‘Choral Exchange’ at the Cannock Mining and Technical College, with Cannock and District Mixed Voice Choir, Chase Orpheus Male Voice Choir, and the Hadley Orpheus Male Voice Choirs. They entered the Cheltenham Open Music Festival, and won! They performed ‘Messiah’ twice in December 1965. Performing at Great Wyrley Methodist Church 30th December, 1965. Image generously supplied by Michael Smith. On March 10th, 1966 the first of 18 Annual Brass and Voices Concerts was performed in Walsall Town Hall, with the CWS Manchester Brass Band, and the guest soloist, Keith Layton. These concerts soon became one of the highlights of the choir’s annual concert programme. On 19th March the choir travelled to Leicester to give their Grand Concert in the De Montford Hall, with the CWS Manchester Brass Band and combined Midland Co-operative choirs. 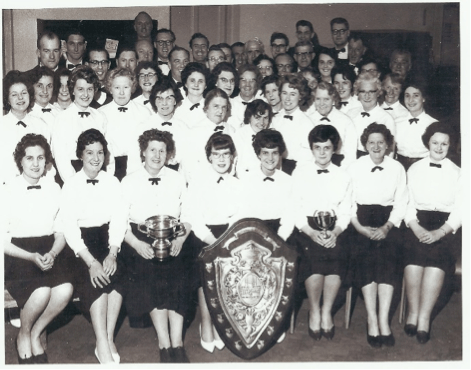 In the summer of 1967 the choir took part in the Morecombe Music Festival, the Bournville Music Festival (which they won), and gave their second Brass and Music Concert in Walsall Town Hall, with the Foden Motorworks Brass band. Angela Beale was the guest soloist in this concert. In 1968 the choir again entered the Morecombe Music Festival, the Newport Music Festival and gave an annual Concert in Walsall Town Hall with the Foden Motor works band when the soloist contralto was Margaret Duckworth. The concert was a 1200 ticket ‘sell-out’. The choir also entered the Co-op Music Festival in Lincoln that year. In total the choir gave 10 concerts that year. In 1969 the choir entered, and won, the Tamworth Music Festival, the Newport Music Festival and came second in the Bournville Music Festival. The choir had again performed 10 concerts in the year. 1970 marked the choral society’s 21st anniversary. The choir numbered 72 members. In true style the choir held a social evening at the Elms hotel in Aldridge, a birthday cake was enjoyed, and certificates were presented to ‘Founder Members still in Choir’, who were recorded as Nancy Stewart, John Corfield, Ada Oakley, Winnie Ewens, Winnie Weston, Hugh Seedhouse, Jack Pearce, Frank Seedhouse, and Doug Birch. The choral society in 1970. Photo kindly provided by Michael Smith. In 1970 the choir entered the Cheltenham Music festival, the Cardigan Musical Eisteddfod (note the return to the Principality…), they took part in the Senior Co-op Choral Festival, had another ‘sell-out’ annual Town Hall Concert where they were again joined by the Foden Motor Works Band, and Edward Darling was the featured tenor soloist The choir did their own recording in the winter, and again had performed 10 featured concerts throughout the year. In 1971 the choral society increased its subscription to £1 10s. In June they commissioned their own record which contained 12 choral pieces. They won the Newport Music Festival again and were presented with the ‘Chief Choral Contest Cup’. In October the choir entered the Senoir Co-op Choral Festival in Coventry, the ladies choir won, the men’s choir won, and the two soloists Doug Birch and Jack Pearce came first and second. The Annual Town Hall Concert featured the Fairey Band, and John Heddle Nash was the guest baritone soloist. The choir had given 20 detailed concerts and the membership stood at 72. In 1972, ‘Power Cut problems’ were discussed (presumably due to the three day week), the choir entered the Nelson Music Festival and won, gave a Charity Band/Choral concert for The Queen’s Royal Lancers and the Mayor, Councillor S. Wright presided at this concert. ‘Pirates of Penzance’ and ‘Dido and Aeneas’ were performed in Chadsmoor Methodist Church, Cannock. The minutes record a meeting of the Co-operative Choral Society and the Brownhills Music Festival Committee. The annual Town Hall Concert featured the Carlton Main Frickley Colliery Band and John Lawrenson, baritone soloist. Cannock Urban District Council sponsored the performance of ‘Messiah’ at the Forum Theatre in Cannock and the choir gave 22 detailed concerts in the year. 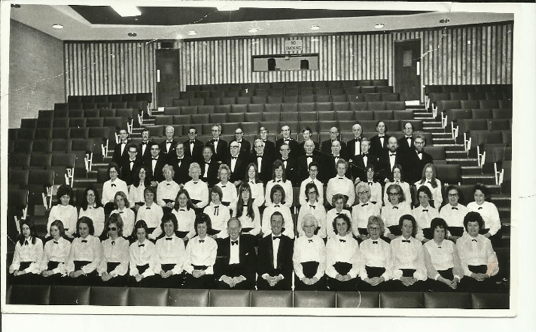 In 1973 the choir gave a concert in the Wulfrun Hall, Wolverhampton with the Dowty Boulton Male Voice Choir, and Mavis Jones, soprano soloist, and Keith Layton, baritone soloist. The choir entered and won the Morecombe Music Festival again. , the annual concert featured the CWS Manchester Band and Cynthia Glover, soprano soloist. The 25th Anniversary Concert was given with the Orchesta da Camera,and featured Elgar’s ‘The Music Makers’. A total of 17 detailed concerts were performed in 1973. Ada Oakley, a founder member was presented with a’ fine gift in her home as she was no longer able to attend rehearsals’. My personal thanks go to Deryck Langford, Doug Birch, Micheal Smith and especially to Bob Watson whose meticulous details, so generously offered, have made this article possible.